What makes for effective leadership? Or are you just another manager? Leadership can be hard to define, and it means different things to different people. In the transformational leadership model, leaders set direction and help themselves and others to do the right thing to move forward. To do this, they create an inspiring vision, and then motivate and inspire others to reach that vision. They also manage the delivery of the vision, either directly or indirectly, and build and coach their teams to make them ever stronger. Think positively – provide a compelling vision for the future of your business in a manner that inspires the people you are leading. Set the tone for the appropriate behaviour you would expect of your team and where necessary introduce guidelines. Of course the better you are at demonstrating these traits the better your team will be. Exhibit confidence – not to be confused with arrogance or self-gratification. Ideally you would like your team to look up to you for inspiration and guidance. Take on a calm and poised manner those around you are far more likely to act in this manner and the self-esteem of the team will be raised. Be emotionally aware – have high ethical and moral standards. In all businesses you are dealing with people and this is more than likely the most costly part of your business and the most important asset you have. Wise leaders are very aware of emotions and strive to be sensitive of others. Learn more about emotional intelligence and how people interact and how you can improve this in your business. Challenge your staff – to prevent complacency and boredom. People quickly become dissatisfied if they are continuously performing the same tasks and projects. It is important to provide goals and objectives that you can demonstrate your commitment to and how much you value their contribution. Rewarding their creativity and contribution will help to develop them to their full potential and increase productivity. Manage failures – and provide a safe environment for trial and error. No matter how hard you try, mistakes and failure will always happen. The important thing is to understand this, be prepared and know how to deal with it. Always remain calm and think in a logical manner, consider the situation thoroughly and the resources available to you before taking any remedial action. Creating a calm environment in your business will assist your team in finding the best solution to any problems or setbacks they are faced with. Listen – give feedback and practice effective communication. In leading a team it is extremely important that they are confident in openly discussing workplace issues with you, give them your time and keep confidentialities. Communicate clearly and honestly with the people around you, listening and interpreting properly what they have to say whilst ensuring that they fully understand your expectations. This will keep any misunderstandings to a minimum. Encourage the people around you – encourage creativity and innovation, committing to others and their continuous training. Sometimes it is difficult to let other take the initiative, but if you can embrace and empower others to take their ideas to the next level, providing constructive advice and support, you can reap the benefits of deeper commitment enhanced problem-solving abilities and increased productivity. Delegate – understand how and when to delegate and clearly communicate expectations. No matter how much you would like to, it is not actually possible for your to do everything yourself. Even if this were possible it would not be appropriate in a team environment. In order to delegate you will need to fully understand the skills and competencies of each team member and be mindful to ensure that they feel appreciated and trusted. It is important to recognise that delegation allows you to demonstrate your confidence in your teams and results in higher morale in the business. Manage performance – any leader knows how important it is to develop the skills of those around them by setting clear and concise expectations in a formal manner. When everyone knows exactly what is expected of them, there is little room for uncertainty and any performance issues can be dealt with quickly. Managing the performance of your team and committing to continuous growth will result in increased productivity and profitability. Find a business mentor – there is always more to learn and it is important that you create this opportunity for yourself. Find a trusted person with whom you are able to discuss all aspects of your business, someone who will question the status quo and assist you in making an informed decision to enable to grow a successful business. Choose to lead and be the person others want to follow. Live your values and beliefs and set the pace through your own actions and expectations, and you will become an awesome leader. If anything I’ve said resonates with you and you’d like to find out more about leadership then do give me a call on 01280 700405 or click here to send me an email enquiry and let’s see how I can help you. 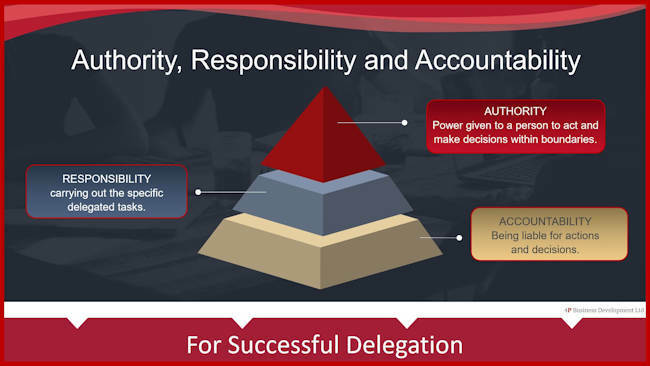 Authority, responsibility and accountability are 3 key terms in the process of delegation! Prior to delegating any task, it is essential to understand how delegation is affected by your ability to manage your employees. You must have the ability to delegate the authority, responsibility and accountability. Authority always flow downwards. It is the power given to a manager or leader to act and make decisions within designated boundaries and achieve organisational objectives. Ordinarily, the authority is shared between the manager and the person receiving the delegation. An organisation cannot exist successfully without authority. It is expected that this individual will exercise the full scope of his authority to properly, profitably, and professionally manage the task. Without authority, a manager ceases to be a manager, it indicates the right and power of making decisions, giving orders and instructions to subordinates. Stress comes from doing it all on your own so delegate … and give the authority to a trusted employee. Responsibility refers to the act of carrying out the specific task, an obligation upon people deemed as responsible. When delegating a task, the manager and person receiving the delegation share the responsibility of completing the work. The term ‘responsibility’ is often referred to as “an obligation to perform a particular task assigned to a subordinate. In an organisation, responsibility is the duty as per the guidelines issued”. When delegating a task, both the manager and the person receiving the delegation share the responsibility of completing the work. The manager has the responsibility of providing instructions on what work needs to be done, while the person receiving the delegation is responsible for figuring out how the task should be completed. Therefore, a leader is responsible and has responsibility for the operation for which they have been given authority. The essence of responsibility is the obligation of a subordinate to perform the duty assigned. Usually, authority flows downwards whereas accountability flow upwards. Accountability always flows upwards; it is the act of being liable for actions and decisions. Accountability is the obligation of an individual to report formally to his superior about the work he has done to discharge the responsibility, and every employee should be held accountable for jobs assigned to them and be able to complete that job as per the standards set by the superior. During delegation of a task, the accountability of the task transfers from the manager to the person receiving the delegation and actually completing the work. It is the answerability for the performance of the assigned duties and any positive or negative consequences associated with their performance are ultimately their responsibility. When delegating, authority, responsibility and accountability are all interrelated. A manager is responsible for all actions of employees under his leadership even if there are a number of layers in the organisation. Accountability means that the subordinate should explain any factors that are responsible for poor or lack of performance, however, the manager is ultimately responsible for the overall performance of the employee. Authority, responsibility and accountability are 3 key terms in the process of delegation, and if you would like to know more then do give me a call on 01280 700405 or click here to ping me an email and let’s see how I can help you. Learn successful delegation by following my top 10 steps! All too often managers struggle to let go of client work or basic tasks and successfully delegate it to their staff. While on the surface it may appear to be easier to do it yourself than to take the time to explain what you require together with the expected outcomes to someone else, there are two fundamental reasons why, in the longer term, it is better to delegate. 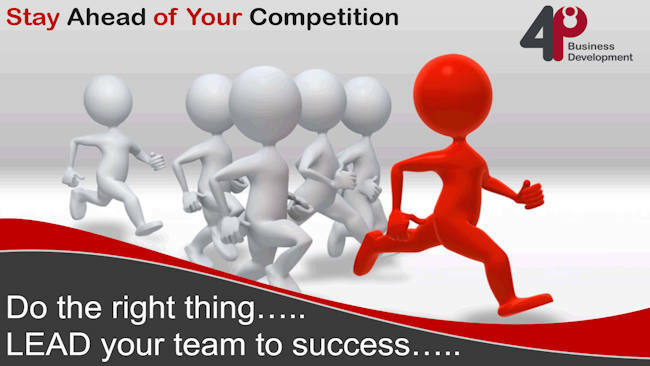 It is probable that your skills are better deployed developing the business strategy and leading the business. By carrying out the task yourself, you’re failing to make the best use of your time. By involving other people in the tasks, you will be developing those people’s skills and abilities so that the next time a similar task is required, you will be able to delegate with a degree of confidence. Defining your long-term business strategy. Ideally, you should then be delegating all the other tasks, apart from a few carefully chosen activities that you find especially rewarding in other ways. 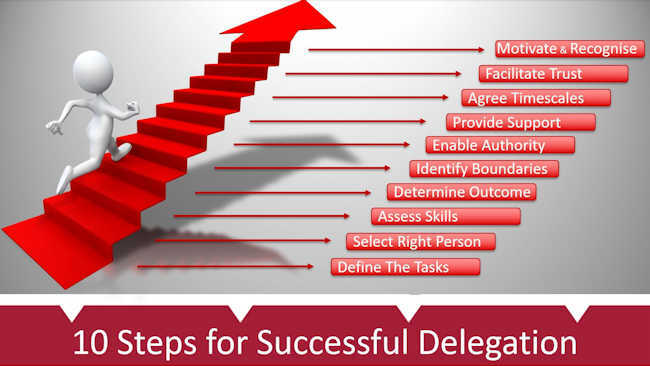 For successful delegation, you should be considering my top 10 steps, before, and during, every delegation process. You should then find that you delegate more effectively and successfully, providing you with more time to dedicate to working on the business. Define the task, spelling out exactly what it is that needs to be done. Select the correct person to carry out the job, someone with passion and is willing to take on such tasks. Assess the skills and attributes of the chosen individual and ascertain if any training is required. Clearly articulate the desired outcome; begin with the end in mind and specify the desired results. Identify boundaries and be explicit as to the lines of authority, responsibility and accountability. Be sure to match the level of responsibility with the level of authority. You will need to understand that you can delegate some responsibility, however, you can’t delegate the ultimate accountability. Ensure that adequate support is provided at all times and be available to answer questions. Agree and set the timescales and any constraints. Facilitate trust and focus on results. It is important for you to remember that your way is not necessarily the only or even the best way. Allow the person to control his or her own methods and processes. Build motivation and commitment. Enable the individual to identify future opportunities, and enable recognition where deserved. Surround yourself with the best people you can find, delegate authority, and don’t interfere as long as the policies that you’ve decided upon are being carried out with the desired outcomes. To learn more about successful delegation and how to empower your team, call me on 01280 700405 or click here to ping me an email and let’s see how I can help you. 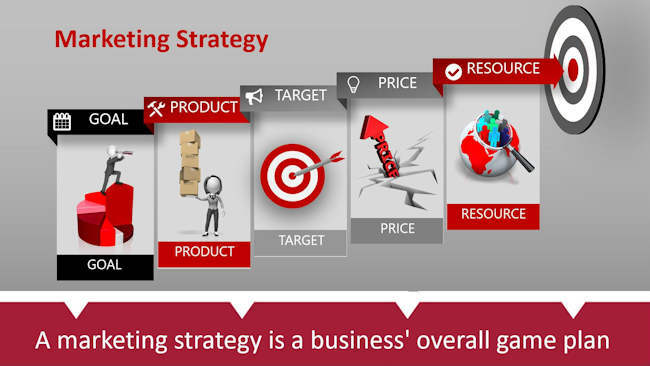 A marketing strategy is a business’ overall game plan! The “what” has to be done. Inform clients about the product or service being offered. Inform clients of differentiation factors. The “how” to do it. Construct marketing campaigns and promotions that will achieve the “what” in your strategy. Having a robust marketing strategy in place helps to ensure that your marketing activities remain aligned with your business goals. This maximizes the business return from your marketing efforts. For help in developing a marketing strategy, or for information on our Marketing Strategy Workshops, do call me on 01280 700405 or click here to ping over an email and let’s see how I can help. 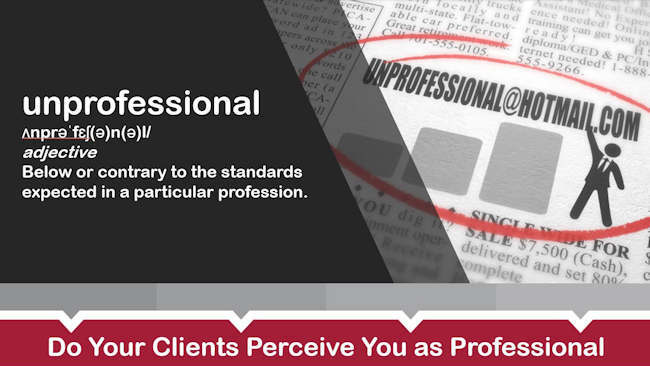 If your clients don’t perceive you as professional, you may be losing business! Virtually every day, I see businesses promoting their products and services through adverts, websites and digital marketing and it amazes me just how many do not have a professional business email address. Even more unbelievable is those that have gone to the trouble to purchase a domain name, build a website and still use a personal free email address! What does this actually say about you and your business? Well, the word ‘unprofessional’ is defined as “below or contrary to the standards expected in a particular profession”. Customers expect your business to have a domain name and a website. An email address like sales@domainname.co.uk tells your potential clients that you’re serious about your business. One called unprofessional@hotmail.com does not. Furthermore, when you own your domain name, you are no longer tied to an email service provider or an ISP. Should you use a free address for your business, you are bound to them and cannot change email service providers or use additional services, such as encryption, that the free services do not offer. Domain names and email addresses are not something any business owner should compromise on. Create a great first impression and make your contact details memorable and appropriate, not embarrassing and unprofessional. 01280 700405 or click here to ping over an email and let’s see how I can help.